Kyle Mizokami for Popular Mechanics: � A drone carrying a grenade infiltrated an ammunition dump in the Ukraine, setting off an explosion that caused an astounding billion dollars worth of damage. The incident points to the growing use of drones in wartime, particularly off the shelf civilian products harnessed to conduct sabotage and other attacks. Ukraine's domestic intelligence service, the SBU, believes that a drone carrying a Russian thermite hand grenade caused a series of titanic explosions at Balakliya, a military base in Eastern Ukraine. 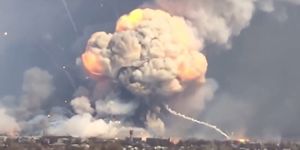 Amateur video of the incident posted on YouTube shows a raging fire spewing out of control artillery rockets, and an explosion and shockwave that sent civilians nearby reeling.